Labor Day is the hard stop of summer, even if the weather stays hot beyond that. There were a lot of blueberry pies this summer and this one was one of my favorite. Mark your summer’s end with something sweet. This recipe combines both cooked and fresh fruit so the pie isn’t so “soupy.” The crust uses both butter and shortening. Too much flour and water will make the crust tough. Both the butter and shortening mixed with very cold water makes the crust flaky. I’ve experimented with coconut oil, vegetable all, it’s all good, but find the one you like. Making pie crust is an art – sometimes my “art” isn’t so fine, but this one came out like a winner. Just keep practicing. 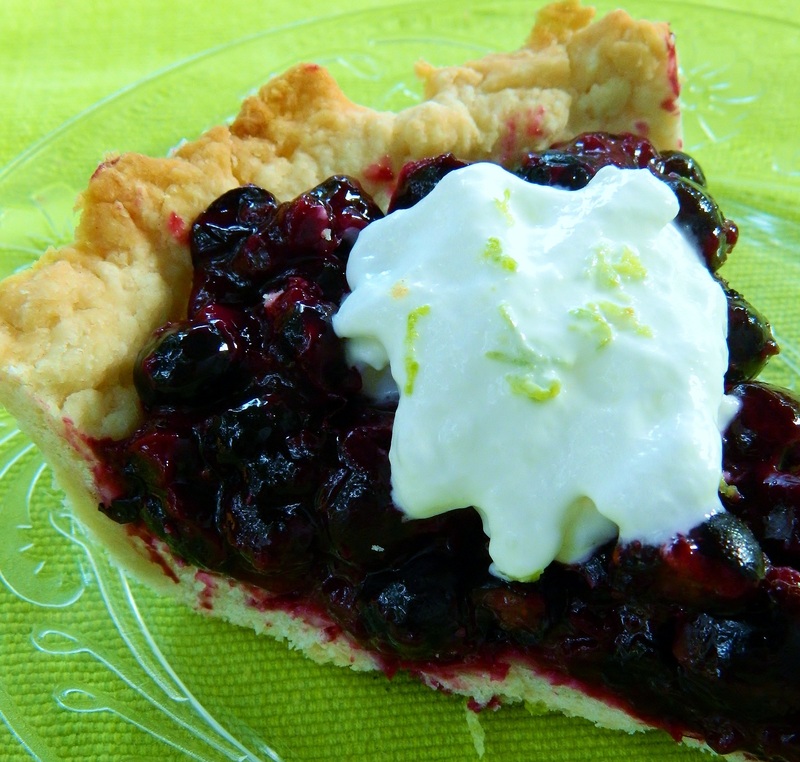 This recipe was inspired by Ronnie S. Benwick’s deep-dish blueberry pie. I appreciate her brilliance of using both cooked and fresh fruit. I might try the same approach with peaches. Combine 3 cups blueberries, lime juice, zest and water in a saucepan. Cook briefly over medium heat until the blueberries have “popped,” about 6 minutes. Whisk together 5 tablespoons of cornstarch and 1/2 cup sugar. Stir into blueberry mixture and cook over medium heating, stirring constantly, until the consistency is like pudding. Remove from heat, add vanilla and gently stir in remaining 3 cups of blueberries. Pour into baked pie shell and chill for at least 3 hours. You can adjust fruit amount if you like. Stir together flour and salt. Cut in chunks of butter and shortening until the shortening/butter are about the size of peas. You can use a fork, your fingers or pastry blender. Sprinkle one tablespoon of water over part of the flour. tossing with a fork. Continue adding water, I tablespoon at a time, until moist. Gather dough in a ball, kneading gently. Roll crust out on a floured surface into about a 12-inch circle. Put into a 9-inch pie plate, crimp edges. Prick bottom and sides of crust with a fork. Line crust with foil and bake for 8 minutes at 450 degrees. Remove foil and bake for 6-8 minutes more until golden brown. (Foil tip from Better Homes and Gardens.) Cool and fill with filling.